Summary. The pictogram indicates that the humanity through the consciousness unification have to make the Transition to the next cycle of life on the eve of the first preliminary cataclysm. The pictogram consists of combinations of several symbols already presented earlier in a variety of crop circles. Thus the middle of the picture reminds the pictogram on August 9, 2005 Wiltshire, England. 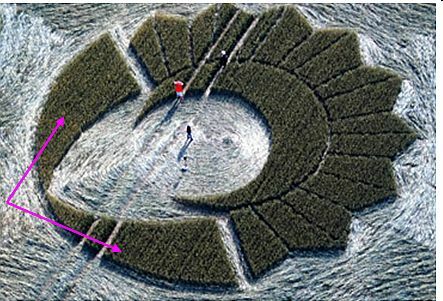 Some well-known crop circle researchers noted that this pictogram resembles rather modified 'Mayan Calendar', presented in the crop circle formation. Let’s consider this pictogram. 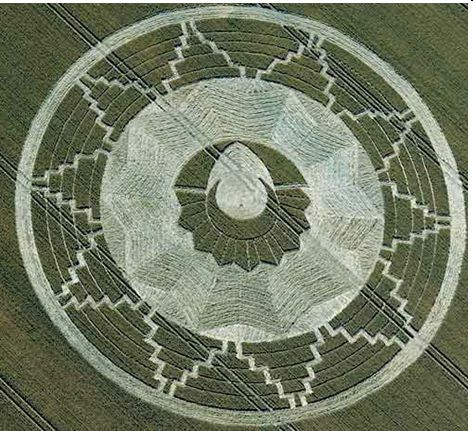 First of all, it should be noted that sometimes rough graphical errors in the presentation of this crop circle is questionable about its origin and possibility of hoax. However, the symbols of consciousness, from which it is composed, allows reading it. The process of consciousness unification is often represented in many ETC pictograms around the world. Behind the widest part of the crescent are located dual rectangular trapezoids with the narrowed end. Each trapezoid has four sides and represents the fourth level of consciousness of human being. It should be noted that this Principle in the pictogram is broken, because on one side are shown two joint trapezoids, but on the other side - only one. 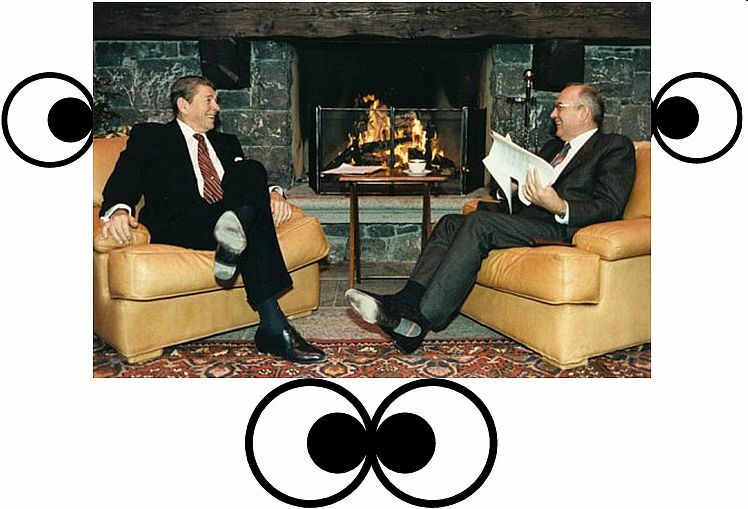 In the pictograms of extraterrestrial civilizations, this Principle usually is not disturbed. Semicircle of trapezoids through the space is extended by two connected horns of crescent (pink arrows). These horns form pointed oval of dematerialization and the Transition. Behind the combinations of symbols in the center is placed monochromatic light image of the many lines which repeats the pattern of dual rectangular trapezoids, expanding it. Expansion of ornament means expansion of cell’ brain area when growing number of people associate with a group of people with united consciousness. On the other hand, this pattern resembles a wave. In this case, the ocean - an environment in which the first will pre-cataclysm will start. The pictogram ends five-step pyramids. They also represent the five-step extension of cell’ brain at the transition from individual consciousness to united. Individual consciousness represent narrow tops of the pyramids. A five-step expansion means transfer from individual consciousness to the united consciousness of the whole civilization. 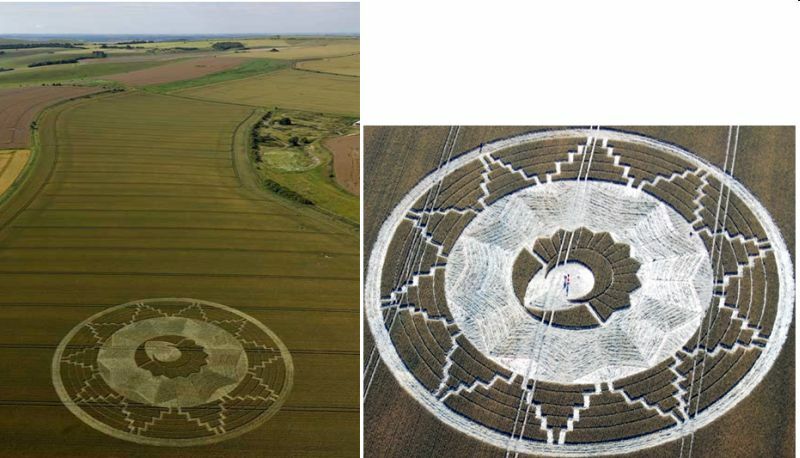 Today among crop circles are many hoaxes made by people using ETC symbols of consciousness and not putting in information any sense. However, through crop circles ETC transmit emergency messages about critical weakening of Earth magnetic field and the beginning of global cataclysms, which occur before the three preliminary cataclysms. Most importantly, ETC transfer to Earth people instructions, how we can get away from global disasters. It turns out that the only way to continue our life is through unification of civilization’ consciousness to make the Transition on the Highest level of the material world, where there are no disasters. However, this Transition we will be able to commit only after the first pre-cataclysms, not waiting for the second one. People do not understand the seriousness of today emergency situation, but simply create a beautiful mosaic of ETC symbols of consciousness. Therefore, hoaxes ruin our future.